It is a glorious morning that has been given to us. This is the day that I spend renewing my spirit. It is up to each individual to figure out how best to do this. I have been thinking about how clutter has alienated us from family and friends. Do you remember when we were children that people used to visit one another on Sunday afternoons? You didn’t make a phone call to warn them or ask their permission to come on over. You just got in the car and dropped in. What ever happened to this freedom to enjoy each others company? Well I believe that the demise of visiting has occurred because Clutter has invaded our lives. All that clutter, made us not want to open the door. If you did open the door you were embarrassed by your home and your guests felt your uneasiness. How sad to think that we have lost relationships because clutter put such a guilt trip on us. Today I want us to think about what Clutter and CHAOS has done to us as a family and a community. We no longer know our neighbors. It may take some doing, but I believe that we can revive the simple practice of visiting if we will just close the door of isolation and clutter, and open our heart to the love and joy of our friends and neighbors. Go visit someone today or invite someone over. Are you ready to FLY with your neighbors by your side? The Holidays will be here before we know it! I want to help you eliminate the stress of the season! Our Holiday Missions start tomorrow! Download your FREE Holiday Control Journal now. If you have a testimonial about how you have opened up your home to visitors we want to hear it. Please send it to me FlyLady@flylady.net with OPEN DOOR in the subject line. Our Purple Rags are half price! Get your set today and get a couple of more sets while we have them at such an amazing price. 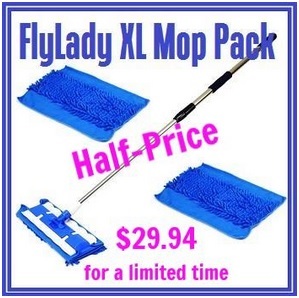 Our XL Mop is also half price now! Christmas will be here before we know it! Think about giving clutter-free gifts! My favorite consumable gift is our FlyLady Calendar! Young people love it and our parents love it! You can see it from across the room. Use our stickers to make it fun and informative. We have kid stickers and adult stickers. Save 20% with Coupon Code BLESSING954. This entry was posted in Morning Musing and tagged clutter, flylady, get organized, neighbors, Sunday, visits, welcoming. Bookmark the permalink.